When we think of Sweden we are likely to think of a country which is affluent, democratic and liberal. On a recent visit to Stockholm I noticed that police were asking “suspected” illegal immigrants for their papers on public transportation. I was curious as to how they decide who is a possible illegal, but the police refused to comment. One is left to wonder, is the selection process purely racial? Swedish police have been carrying out an operation called REVA together with the Swedish prison service and migration service. The abbreviation REVA stands for Legal Certainty and Effective Enforcement (Rättssäkerhet och Effektivt Verkställighetsarbete) and seeks to advance the effectiveness and enforcement of deportations; REVA was co-funded by the European Return Fund (ERF). All EU countries, with the exception of Denmark, participate in the ERF and have allocated €676 million for the period 2008–13. Specifically, it seeks to improve return management as well as to encourage the development of cooperation between EU countries and with countries of return. Put simply, EU countries pay for flights and accommodation of those who are deported. Under this operation, which has been running for some time now at the behest of the Swedish Government, ‘right of residence’ checks are carried out along with ticket inspections in the Stockholm underground. These checks have led to a wide-ranging debate in Swedish society and it seems certain that they are based on people’s skin colour and appearance. The Swedish media have reported that cancer sufferers without a residence permit do not dare to take the underground to go to hospital for fear of being caught in one of these checks. The Swedish police claim that the checks are carried out only for justifiable reasons and are not based on a person’s appearance, language or name – really? Gonzalo Munoz, born and raised in Sweden by Chilean parents, was approached by a police officer while waiting for a friend inside a Stockholm metro station. The officer spoke to Munoz in English: “I’d like to see your passport because you are suspected of being in Sweden illegally”, the officer said, according to an account offered by Munoz to Swedish TV station. When Munoz was able to produce his Swedish passport, the officer apologized and released him, but the incident nevertheless left him angry. He said “It’s discriminatory and it feels like all of this work going on at Central Station is based on prejudice and racism.” Munoz’s story is one of many that have emerged in recently. This new measure by the police in Stockholm is a reflection of the Swedish government. 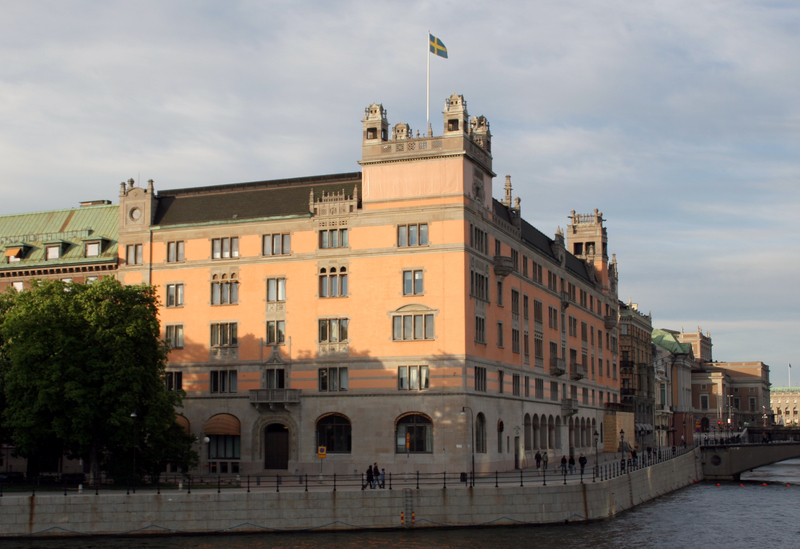 The current inhabitants of the Swedish parliament have been decimating many of Sweden’s public services by selling them off to private companies. This short-term vision has angered many Swedes and the situation of racial profiling on the city’s public transport system is yet another representation of the government’s right-wing objectives. The targeting of “foreign-looking” commuters is an effort to deport illegal immigrants. In 1994, Ikea founder and Sweden’s richest man Ingvar Kamprad, revealed his youthful Nazi sympathies. He confessed to a nine-year friendship with Per Engdahl, the openly pro-Nazi leader of the Neo-Swedish movement. Kamprad claimed he couldn’t remember if he’d joined the Nordic Youth [cough cough], Sweden’s equivalent of the Hitler Youth. Are there still fascist elements in Swedish politics? Commentators from across the political spectrum have reacted angrily to stories of police engaging in questionable tactics to enforce deportation orders. Speaking about the police activity on the Stockholm metro system, the Green Party’s migration policy spokeswoman Maria Ferm said that “This has turned the metro turnstiles into a life-threatening danger zone for the most vulnerable people in our society.” Centre Party MP Johan Hedin said police should be more careful in deploying ID checks, warning that police’s unwarranted controls “Are not only a crime against good taste, but also against the law and should stop immediately.” Migration policy spokespeople for the Christian Democrats and Left Party also condemned the behaviour of Stockholm police, with the Christian Democrat MP Caroline Szyber calling it a “witch hunt”. Of course, the national police spokesperson defended officers’ methods, explaining police were simply following the mandate given to them by the government. To counter these excessive racial policies, activists are tweeting to alert people where the police are working on any given day: “Police at Högdalen metro station checking IDs, be warned,” read one tweet recently. An informant network has also sprung up in other social media. Here we are, in a globalised world – the 21st century. It still seems that if one does not look Caucasian in Europe – he or she is perceived as a foreigner in the eyes of these policies, which exist in most European countries. James J on John F. Kennedy – the Warmonger Ireland can be Proud of. Ninth Level Ireland » Blog Archive » Nick Griffin to Debate at Trinity? … Again? on Nick Griffin to Debate at Trinity?………Again? michaeleriksson on Mixing Moralism with Medicine; I was Refused the Pill from my Family Doctor. There is always a problem of immigration in every country. However, I hope that the general Swedes are not racist like the police and more accepting.